“A lot of young people are somehow put off struggle and difficulty. Boredom thresholds now because of the nature of entertainment, people are adrenalin addicted and I think that one of the big unspoken addictions in our society is adrenalin. We are addicted to drama, everything has to be exciting, black and white there’s no middle ground, we’re all being gradually pushed into this area where our attention span is that of a gnat. Difficulty, learning a skill that might take 10 years over 10,000 hours is something that frightens to death, when in fact when you attain that it is probably the happiest most joyful thing you can do”. The Rosetta Vase, 2011. 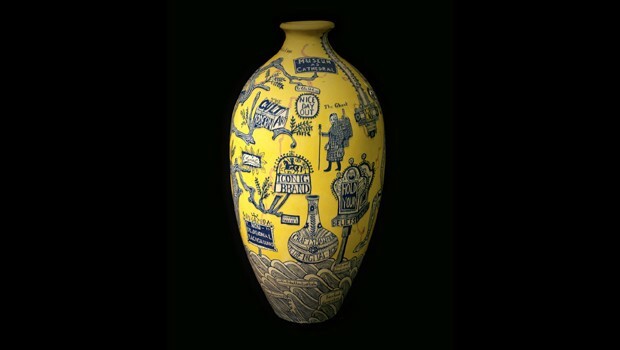 © Grayson Perry.